Director Scott Campbell infused William Shakespeare’s circa-1594 comedy with a heaping helping of imagery, characters and magic directly from the Harry Potter fantasy books, one of the best-selling series of all time. Proteus leans over Sylvia (Amber Warner). The re-imagined comedy enchants with elves, dementors and wizards who cast spells with dramatic flair. The scenery rotates between locales and includes Diagon Alley, complete with the Leaky Cauldron, The Apothecary and Flourish and Blotts. The plot centers around two buddies, Valentine (Ben Tietz) and Proteus (Trevor Penzone), whose friendship is tested as they become rivals for the affections of the same woman, Sylvia (Amber Warren). 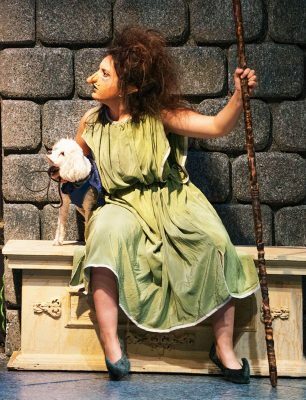 Many of Shakespeare’s stalwarts are transformed into non-human creatures, including Launce the fool (Tarnim Bybee), Speed (Bri Ha-Hguyen) and Lucetta (Devaune Bohall). Crabb the dog is in fact played by a real (adorable) canine. Even the still-human characters are garbed in costumes that harken to both Shakespeare’s original play and the wizards and witches of Hogwarts. All-encompassing, heart-throbbing love is the overarching theme of this marriage of wizardry and Shakespeare, appropriately timed to run during Valentine’s Day week. 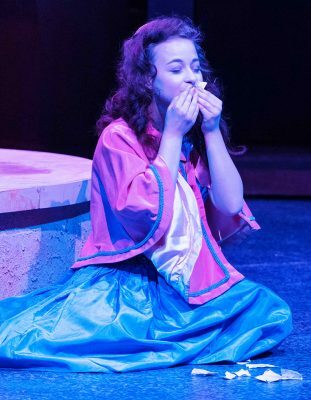 Julia (Sarah Schalick) is wracked with love as she both rips up and kisses a note from Proteus. In another scene, we see how love causes radical contradictions in Julia. Handed a note from Proteus, she alternates between a glowing happiness and dark confusion as she rips up the note, kisses the pieces, reads a torn edge of one and hurls the shreds to the floor. “O hateful hands to tear such loving words! Proteus follows Valentine to Milan, where Valentine has fallen in love with Sylvia. Sylvia has a (scene-stealing) suitor, Thurio (Jeremy Carr) a match approved by the minister of magic (Kayana Sweeney). Launce the fool (Tarnim Bybee) with Crabb. Against all wisdom, Proteus, too, falls in love with Sylvia — even though his best friend, Valentine, has professed his love for Sylvia, and even though Proteus has given his heart to Julia. Proteus uses a wand to try to remove his feelings for Valentine and Julia. This colorful romp through Potter-meets-Shakespeare contains a trio of characters similar to the Death Eaters, brilliantly costumed dementors (dark creatures who can remove a man’s soul) and wizards who use wands with dark intent. And in the end, of course, all’s well that ends well. Tickets are available here. Students get tickets free with ID. Great job, Laurie, capturing the essence of this wonderful melding of J.K. Rowling and William Shakespeare. We saw it Friday night and absolutely loved it. Phenomenal set, stellar costumes, delightful human cast, and oh that puppy! Congratulations to COFAP, Dean Pensis, Scott Campbell, Bill Symington and all the students.